Could hell's fire be symbolic? Imagine for a moment that hell's "fire" hell is just symbolic. If so, then understand that a symbol is merely "smybolic" of a greater reality. This would mean that the greater reality which fire then symbolised, must be much more fearful than the symbol of souls burning forever in an lake of fire! The following description of God's fearful judgement is found in the last book of the Bible: Revelation 20, verses 11 - 15. "And I saw a great white throne, and him that sat on it, from whose face the earth and the heaven fled away; and there was found no place for them. And I saw the dead, small and great, stand before God; and the books were opened: and another book was opened, which is [the book] of life: and the dead were judged out of those things which were written in the books, according to their works. A man who went to hell - and stayed there! "...the rich man also died, and was buried; And in hell he lift up his eyes, being in torments, and seeth Abraham [a man spoken of in the Bible well known for his love of God] afar off, and Lazarus in his bosom. And he cried and said, Father Abraham, have mercy on me, and send Lazarus, that he may dip the tip of his finger in water, and cool my tongue; for I am tormented in this flame. But Abraham said, Son, remember that thou in thy lifetime receivedst thy good things, and likewise Lazarus evil things: but now he is comforted, and thou art tormented. And beside all this, between us and you there is a great gulf fixed: so that they which would pass from hence to you cannot; neither can they pass to us, that would come from thence. Then he said, I pray thee therefore, father, that thou wouldest send him to my father's house: For I have five brethren; that he may testify unto them, lest they also come into this place of torment." Think about the following quotes from Jesus who spoke more of hell and judgement than of heaven. Why. Many believed they would go to heaven because of their own goodness. They needed warned. The first three quotes are from Luke chapter 16 and the man who went to hell and stayed there. 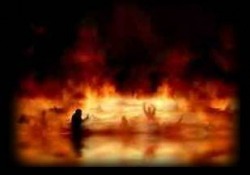 Hell will be beyond anything humanly imaginable! Hell is Forever. There will be no hope of getting out - ever! Consider other examples of how the Bible warns of the eternity and permance of hell! In the whole of the Bible, there is not one verse that offers hope for anyone who enters hell. May the Lord Jesus open your eyes to see that YOUR SOUL is in danger of ETERNAL Hell. Your sin offends God and you hang by a spiders thread over the flames of eternal damnation. If you have not done so, do the GOOD PERSON TEST now and consider how God sees your sin. Maybe you think God is unjust in creating such a terrible punishment for sinners. And it is terrible. Maybe you think that you deserve less for just a few lies and the occasional cheating, and lusting and greed and spiteful anger, and ignoring God and what he has done for you all your life. If you do, you are probably like a majority of people on the planet. Jesus took hell very seriously. . .
What could possibly be worth eternity in hell? Hell will not be a party. You have been warned! Will I be welcomed into heaven or cast into eternal hell? Not only have you been warned but God has provided you with a way out. You will be without excuse on the day of judgement! You need to understand what God has done for you through the shed blood of Jesus. If you are not 100% sure that you will go to heaven when you die, do the LIFE AFTER DEATH TEST You cannot afford to be wrong because eternity is the wrong thing to be wrong about. Please, make sure that if you were to die tonight, you would go to heaven. If hell was a place where you were destroyed and then ceased to exist (ie. annihilation), then that means people like Hitler would suffer no eternal consequences for their crimes. It means that we may as well all "eat drink and be merry for tomorrow we die" and ceast to exist. Surely non-existence cannot be seen as punishment. If you don't exist, there are no regrets, no suffering, nothing. You could do what you like in this life and then you would cease to exist. You think the world is a mess now. Imagine what it would be like if there was no conscience - none at all - in the heart of any man, woman or child. Imagine if there was no healthy fear of eternal consequences holding people back. If death is the end and there are no eternal consequences for choices made in this life and good and evil are only what YOU want them to be, then everyone would be a law unto themselves and this planet wouldn't last five seconds! Apart from these things, everything we have considered above about hell tells us very clearly that it is a place of torment, it is forever and there is no hope gettng out if you go there. The idea that death is the end, fits very well with evolutionists who teach that your meaningless existence is just the result of random atoms bumping together. We all came from a big bang they say. A cosmic accident that sparked life in the universe. So you are just a meaningless accident - even your thoughts are meaningless because they too are just the result of random atoms bumping together. If you say you've found meaning and purpose in life, you are deluded because that belief in itself is just the result of random atoms banging together. In the end, death is just the end to a meaningless existence. That is if you follow evolutionary theory through to its meaningless conclusion. However, your life is NOT meaningless. YOU were created for a purpose. And that is the reason for hell. Hell is the final result of rejecting the purpose for which we were created. The purpose for which we were created is to have a relationship with God. CLICK HERE NOW and see if you are guilty or innocent of breaking that relationship. And if you are guilty, discover how you can start again with God today. Yes, if you need to, you can get right with God today! You can do this where you are, sitting in front of your computer. If you discover for yourself that you are guilty and deserving of hell, right now you can have your sins forgiven, be born again into God's family and have eternal life. God does not want you to go to hell.